In addition to sending a cease-and-desist letter to a popular Chinese music gear site, court filings reveal Behringer tried to sue rival manufacturer Dave Smith Instruments – and unnamed GearSlutz users. And they lost. 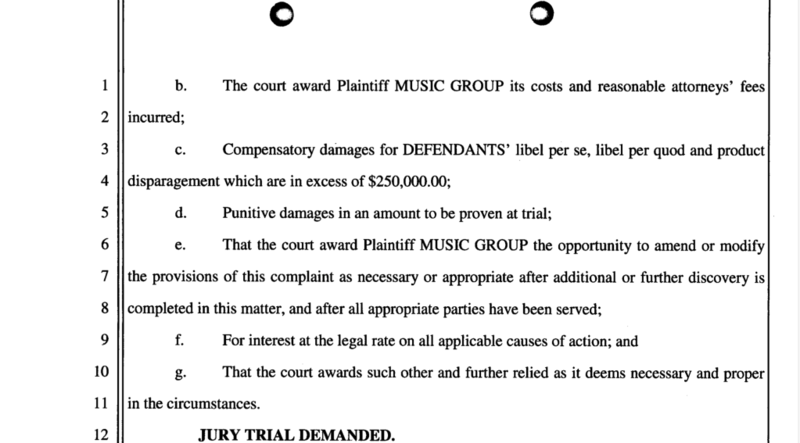 We’re seeing the tail end of those filings now, as Dave Smith Instruments file to recover their six-figure legal costs from MUSIC GROUP, in effect for MUSIC GROUP having filed what the courts found to be a lawsuit without grounds. Last week, CDM reported that Behringer’s global entity, MUSIC Tribe, had sent a cease and desist letter to Chinese news site Midifan, threatening a criminal defamation lawsuit would be the next step. However, as of this writing, no lawsuit has been served. CDM was tipped off today that court filings are available showing MUSIC GROUP (in the USA) proceeded with legal action against Dave Smith Instruments and various defendants for libel per se, libel per quod, and product disparagement, in the state of California, seeking damages in excess of US$250,000. The filings are dated 9th of June 2017. Behringer also included reference to Dave Smith’s Prophet Rev2 as a competitor to the Behringer Deepmind 12 in the suit. The lawsuit was directed exclusively at commentary published by a DSI employee and commenters on the Gearslutz forums. Behringer Mini model D? A good idea? Dave Smith Instruments declined to comment for this story. These observations range from general complaints about Behringer products copying other products or characterizing business practices as “underhanded,” to specific allegations – particularly, a post by Karavidas that claims the Behringer CT100 cable tester is a “blatant copy” of a product by Ebtech. It would be hard to prove or disprove what Behringer will do in the future (obviously), but note that past lawsuits by Roland and Mackie in fact claimed some past Behringer-branded products were deliberate copies. Whether or not those makers won those lawsuits, it means that they did product a significant amount of material evidence as a matter of public record. Libel per quod. Paraphrasing: claims about Behringer’s business practice and alleged history of copying other products are false and have hurt the company’s reputation. This category requires demonstrating specific legal damages in court. If you can find your way through the court documents, you’ll find exhibits reproducing the complete forum thread, plus a cease and desist letter sent on the 7th of March 2017 – and an agreement by Tony Karavidas to comply with the letter. Behringer had not yet responded to CDM’s request for comment as I published this. If reading the description of the Behringer decision sounds chilling – as in, anyone could raise this kind of suit and silence dissent – then you may appreciate understanding what anti-SLAPP rules do. Anti-SLAPP, or rules against Strategic Lawsuit Against Public Participation, are designed to protect against frivolous tort lawsuits, are specifically designed to make sure that only serious defamation cases get to court. 1. The statements were posted on a forum – that is, a public forum. 2. They’re in the public interest – you should be free to discuss products’ design and quality, and the business behind them, which Behringer themselves made public. 3. Since Karavadis was not himself in the business of selling instruments – just working for DSI – he didn’t fall under an exception to the above. 4. These were subjective statements. Point four is the kicker – we’re free to have opinions about instruments, about music, about any matter of public discussion. And that combined with a public forum is the essence of free speech. Lawyers for the defendants also argued these statements about MUSIC GROUP didn’t constitute malice. We are bound to be accurate about the facts of products from makers like Behringer and the history of how they were made – and free to be impassioned about opinions. I’m still digging through a very slow-loading site via a VPN (since I’m blocked from the US site here in Germany), but I welcome additions or corrections. If you’re a lawyer, in particular, please feel free to correct me and I’ll amend this story as I know more. Late last week, I shared news that Chinese news portal Midifan had received a cease and desist letter from Behringer, via Music Tribe.